Based on her 30 years of study on indigenous health and practices of the Igorots, a professor from the University of the Philippines Baguio is invoking the power of spiritual healing over diseases covered by the indigenous and spiritual practices in the Cordillera region. 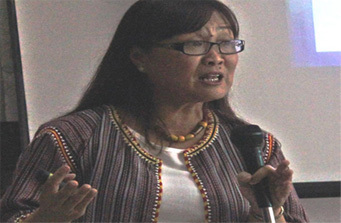 UP Baguio professor Erlinda Palaganas authored the study, which focused on the traditional practices of various tribes in the region and that mainly contributed to the health and welfare in their communities. It presented health related researches by various health practitioners in the Cordillera from 1980 to 2010. “Unfortunately, indigenous knowledge has always been perceived as backward, negative and with no positive effect, but what the people don’t look into is its principles and it being a way of life. If it helps in the health of the person, then it has a basis,” Palaganas said. Palaganas also highlighted the herbal medicines endemic in the communities. While these are being used, spiritual beliefs influence the users’ knowledge of the potency of the medicines. Citing the late botanist Leonard Co’s study of medicinal plants and herbs, Palaganas said harvest is best during Holy Week or summer. 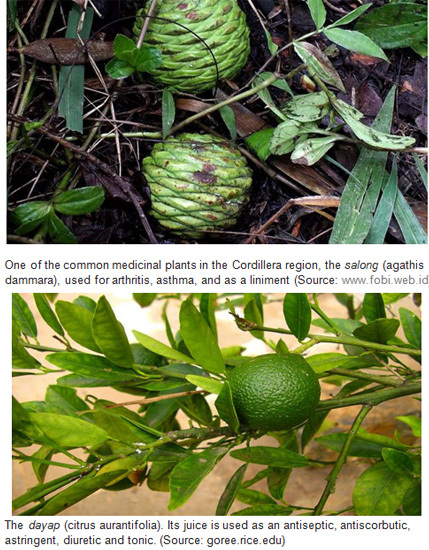 Co authored the book Common Medicinal Plants of the Cordillera Region first published in 1989. “Leonard Co said it is best to harvest these medicinal plants during summer or holy week because the chemical content in the plants are concentrated unlike rainy season when the contents are washed out. But if it has something to do with the death of Jesus Christ, then that can be considered because the effect is psychological,” Palaganas said. The older generation of the Kalanguya tribe are the main ethnobotanical knowledge holders, but the process of passing on the knowledge is prevented by the out-migration of younger generation of Kalanguya peoples, it said. Palaganas cited a 1986 book titled Igorot: Traditional Ways of Life and Healing among the Philippine Mountain Tribes (written by Norbert Kohnen and Petra Kohnen), which explained the importance of healers, ancestors, prayers, rituals and beliefs in healing. The book said in the Kankanaey tribes, there are particular healers or diagnosis specialists who practice diagnostic techniques. The mansip-ok employs special techniques or dissects offerings for disease diagnosis; the mangegey falls into trance and enables the sick person and those around him to get into contact with the offended spirits; the mambaknao are sign interpreters,who are usually men who read changes in water, yeast or a beer infusion; man-ila are usually old women who diagnose diseases by looking into the eyes of the ill; the mansingeng is consulted if a disease is attributed to evil spells or malevolent magicians. The study said plants are believed to be entities having influence on the psyche and spiritual belief of the people, but can make people sick; through the power of Kabunyian (God), plants and herbs can heal the sick. It also said that certain locations have spirits that can have good or bad effects on one’s fate; violations of taboos and practices related to places may result in poor health. Sounds are important in the traditional practices of Besao people, as the study states that sounds are believed to have effects on one’s spirituality and mood; music can heal people’s psychological problem and are of equal importance in rituals, in calling good spirits and driving the bad ones. “(This practice) is like the sound therapy in some hospitals that play classical music for patients in intensive care units (in the United States),” Palaganas said. Citing the Fiar-od’s study further, Palaganas highlighted how the dead are regarded in healing practices. “The dead are believed to have powers to communicate with the living. The living’s relationship and interaction the dead and the spirits can influence the living’s health and healing condition,” Palaganas said. She further highlighted that the spiritual belief of Besao contributed to the health and long life of the people, and their use of herbal medicines have made them less dependent on drugs that have lots of side effects. Palaganas said the practices of the various Igorot tribes beliefs and taboos exist in relation to health and life cycle. The relationship and interaction with spirits is intrinsic in health and healing as the healers are respected. Palaganas said indigenous health knowledge should be in sync with the modern ways of medicinal practice and should always be a part of health institution’s perspective. Palaganas said hospitals should also be culture-sensitive to patients who believe that culture and tradition are important to their healing. They should not be condemned for believing in the said practices, she said. “Benguet General Hospital is culture-sensitive, they allow their patients to leave if they believe that what they dreamt about the previous night would contribute to their healing,” Palaganas said. Palaganas said medicinal plants and herbs that are endemic to the community should be protected to prevent multinational and pharmaceutical companies from taking advantage of them.